I was scheduled to autocross on Sunday, and at 4am on Saturday, I finally got the transmission back into place. My jack proved about an inch too short, and tired muscle had to do the rest. Sleep and money whirled clockwise into a vortex before disappearing into a lost weekend, but I knew at the first orange cone, a long right sweeper, that it had all been worth it. I’m sold. Autocross is always worth it. Take one parking lot or other large paved area. Roll flat onto cookie sheet. Sprinkle with orange or formerly orange traffic cones until race track forms. Smoke for 6 hours until golden brown. This is the recipe. Autocross, sometimes known as solo, is a low-cost, low-speed, low-commitment form of time trials driven on in a mini racetrack, usually in runs of a minute or less. Car clubs run autocross events all over the place, though the Sports Car Club of America is the most notable, operating regional competitions and a national championship. My pack of weird car friends and I had been threatening all summer to enter an event, so we finally picked a day and registered online. It’s $38 per event if you’re a member of the SCCA, with another $10 for a weekend membership if you’re not. Far cheaper than the average track day. Then, about a week prior to the event, the clutch in my artistically keyed, $760 Civic started to slip. I thought perhaps that there was still air in the clutch lines after I replaced the master cylinder a few weeks ago, so I bled it again. I wonder if the people who decided to force hydraulic clutches into sub-2 liter compacts knew that they would one day have so many enemies. But there was little change after the bleed. My trusty local Honda shop divined a bad rear main seal, which had begun to drizzle the flywheel and clutch disc with motor oil. And since I’d replaced one of these before and didn’t want to pay a labor fee greater than the cost of the car, I decided to do it myself. The rear main seal surrounds the engine’s output shaft, so to replace it, you must first remove the: CV axles, transmission, clutch, and flywheel. So you might as well replace the clutch while you’re at it, and vise versa. But I work slow. My fingers are basically less dextrous half-animated carrots. Undoubtedly contributing are the nerves I keep severing whenever I injure myself, leaving dead zones in my feeling and scars of trepidation that run deeper than the physical ones. I’ve also achieved the human rank of Old and Sore, No I Won’t Play Football With You, which does nothing to speed anything along. So I’m glad I had a week. 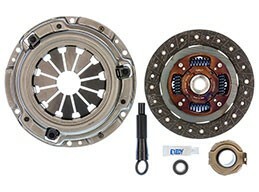 I ordered this Exedy clutch kit and the accompanying flywheel, and picked up a Honda genuine rear main. Meanwhile, at home, I jacked up the car and began to take it apart with the help of a rather excellent forum thread I found on the subject. The CV axles, thankfully, were still in fighting trim, so they stayed. The Exedy clutch kit was well packaged and included a new throwout bearing, pilot bearing, clutch, pressure plate, and a little ketchup packet of input shaft grease, which came in handy when I realized that I couldn’t open the drawer containing my own grease, thanks to the tiny dimensions of my garage with the car in it. Exedy is a Japanese brand who has been around forever, and they’ve never let me down. It’s hard to remember the full process of pulling the transmission and replacing the clutch, as if I was some character on LOST, and only brief flashbacks were revealed to the audience. But it was finally back together, with only a few minor details to finish, and it was only 4:30 AM, the day before the race. I scrubbed off and went to bed, then got up two hours later for Cars and Coffee. Later that afternoon, I finished up those few details and began to prep the car for autocross. After a solid and spirited test drive, I conceded that I had somehow gotten the job right, so I went to overinflate the tires. Tire pressure is a huge deal when autocrossing. Because it depends so much on maneuvering, low pressure can cause more body roll and less traction in the corners. I also dumped my floor mats, spare tire, and anything else loose or weighty in the cabin. I wouldn’t want any extra weight or debris out on the course. Now the beast was ready. And I got up at 5 AM on Sunday to go help setup at my church’s mobile campus. After an hour of this, I headed out to Independence, site of the Metropolitan Community College’s Precision Driving Academy, a grid of asphalt (with concrete at the intersections) used by area police departments to train new officers in the art of controlling a 2.5 ton patrol vehicle at speed. On Sundays, they let the Kansas City Region SCCA have the place, cones are arrayed on the pavement, and a track begins to take shape. Previous PostPrevious Are automotive LEDs worth the cost?